The Hospicio Cabañas in Guadalajara, an UNESCO World Heritage Site, is 3 miles or 5 kilometers from Casa Madonna La Providence. 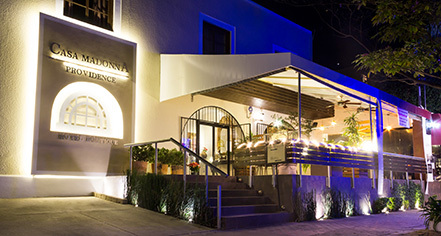 In one of the most beautiful and rooted zones of Guadalajara, Casa Madonna La Providence is an elegant space designed especially for sophisticated travelers who appreciate exclusivity, excellent service, and good taste. Influenced by his professor and Pritzker Architecture Prize winner, Luis Barragan, Casa Madonna La Providence was designed in the 1950s by the famous architect Ignacio Diaz Morales. 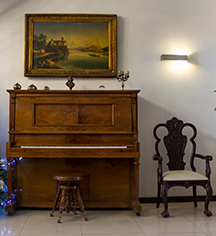 The 12-room Casa Madonna La Providence is a perfect fusion of old and new, providing a sense of harmony, elegance, warmth, and comfort to its visitors. Guests are greeted by a grand and exquisite lobby with original furnishings from the Belle Époque, unique art, and a stunning chandelier. During their stay, guests unwind and can choose from a selection of books in the library or socialize in the intimate bar with refreshing cocktails. The Mexican terrace and roof garden is a notable space to enjoy the balmy weather and is available for private events. Casa Madonna La Providence, a member of Historic Hotels Worldwide since 2016, dates back to 1940. The hotel’s architect, Ignacio Diaz Morales, collaborated in the creation of the first school of architecture in the city of Guadalajara with the support of the governor of Jalisco. Learn more about the History of Casa Madonna La Providence .